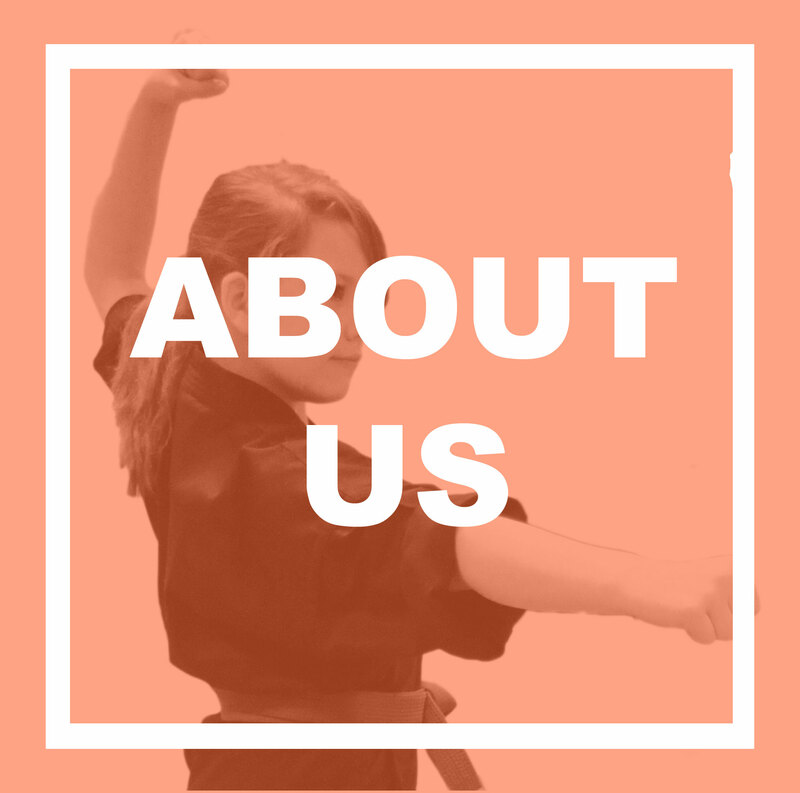 At Bushido Hombu we offer over 35 years of knowledge and experience in Karate. Memberships are available for clubs, instructors, and individuals. 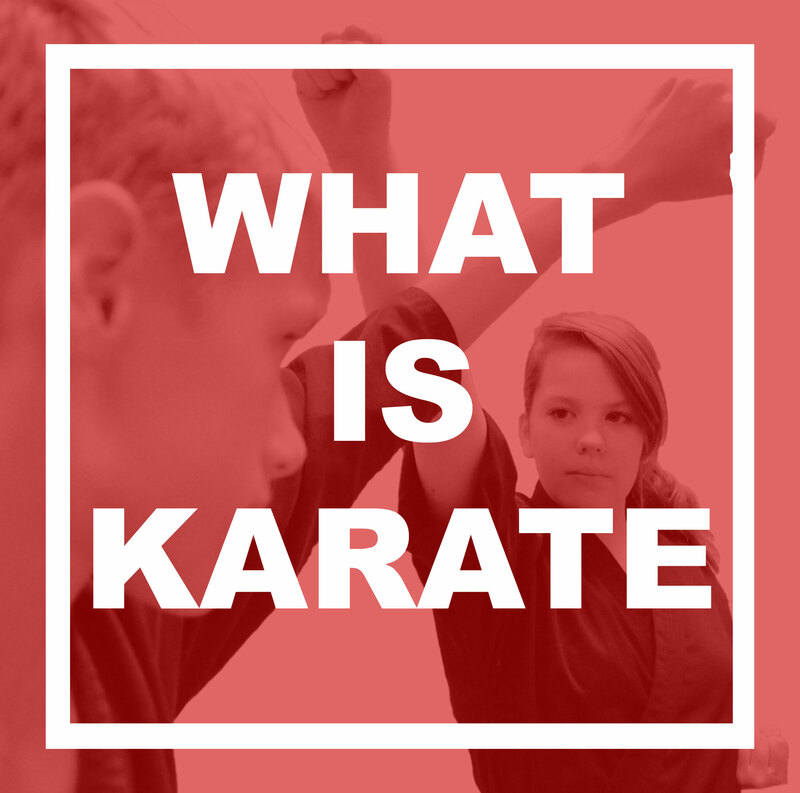 We teach karate in order to help people achieve their personal goals, whether they be increased fitness, improved confidence, greater levels of concentration, improved discipline, to gain an increased level of personal safety or for the love of the art. At Bushido Hombu we are not affiliated to any other organisation, nor do we follow a mainstream style (ryu).Our senior instructors have received a majority of their training in Shotokan but have enhanced this with many training methods, concepts and kata from other styles.We aim to constantly evolve our understanding of karate through training both within our group and other traditional groups.This enables us to gain better understanding of the original training methods and ensures we are not losing the essence of the art that we practice. In line with our ethos we train in the traditional values and methods, but in an environment befitting to our modern western lifestyles.We do not follow dogma, nor force members to take on the presumed ways of a Japanese samurai.Instead we help you to achieve your goals by guiding you along your karate path rather than being an oppressive figurehead. This means our classes may appear to be of a more relaxed nature, however the levels of respect are maintained in line with the traditions of karate. Those who achieve higher grades will receive more information and education of these aspects of Japanese Dojos to enable them to attend courses and events hosted by other groups. Overall we are about training in karate and making it enjoyable while achieving results. This is the point where most clubs will list chapter and verse of who they have trained with, when they trained with them and what competitions they have run (usually stating they were British / European / World champions at some point… they fail mention that usually only a few organisations or dojos took part in the tournament). Instead we would like to give you an insight into the things we have done that will actually count and mean something to you. Between the senior instructors we have been members of around 9 martial arts organisations and associations (including the JKA), most of which have been Shotokan based. This has given a varied experience even within this one style; having some groups led by instructors with a heavily Japanese background and a keen objective to study “koryu” – the old ways, others with a more sporting / competition based ethos where tournament success was paramount, and the finally those with a self-defence foundation. We have used the experienced gained within these other organisations to run the Bushido Martial Arts Association since the 2002. As an organisation we have attended events held by other groups and hosted our own, including in-house competitions and external instructor led courses. We have had steady growth and are careful with those organisations that we interact with and the instructors/clubs that we allow to join. All instructors are encouraged to broaden their experience and knowledge by training in other martial arts and fitness systems. The intention of this is to promote thinking and prevent stagnation through looking for synergies of theory and approach, new/different training methods and true differences. I trained with Kevin Archibald for almost two years and Monday nights were always a highlight of my week. I loved the mixture between Katas and self-defence in the class and that Kevin always included everybody in the course, listening to what each individual wanted to get out of the class. I was especially impressed how Kevin constantly tried to improve the training based on new knowledge he had taught himself or learned in other courses. Being a physiotherapist I can say that Kevin’s knowledge about the body and how to train it combined with the huge background about Karate was a perfect base for the class. Kevin never only taught movements he also transported the spirit of what Karate is about. Thanks for the time, I am still searching for a class here in Germany that is as good as Bushido Hombu - I have tried three by now. Still haven't found the right one. I've been training under Kevin Archibald since November 2012. I'm very pleased that for my path to learning karate I found and joined this club. It's a great opportunity to learn from the best. Kevin is very friendly to all his students and colleagues but at the same time radiates authority especially through being respectful to everyone and his display of top form and skill. He treats everyone as equal and equally and promotes the same behaviour in his students. He is a great motivator, his enthusiasm for martial arts inspires children as well as adults. Kevin leads his students towards perfection, not only physical fitness and form but also perfection of mind and character. During the classes and the invaluable Self-defence seminars Kevin follows very strict health and safety rules, maintaining an injury free dojo environment. I'm looking forward to seeing all his plans and visions involving the spreading of popularity of karate, promoting fitness and giving youth an amazing opportunity to train and choose a healthy lifestyle coming to life and I hope to be part of them. I have been very pleased at how Kevin and his team of instructors allow and encourage members to progress at their pace. This club is not focused on how quickly you can progress through belts, the focus is on mastering and maintaining good skills. There is a balance of fun, fitness and karate in the family sessions which helps keep younger members engaged. I have used the club to develop focus and self discipline in my children. Despite my reservations about allowing my children to participate in a martial art as I'm very much a pacifist I am pleased they are members of this particular club and have recommended it to others on a number of occasions. Kevin is a great teacher, his knowledge and professionalism is second to none. The classes are well structured and all material is easily digestible.I have learnt much under his instruction. Kevin is a highly dedicated Sensei who strives to deliver the best and safest training in all his classes. His approach is to help every person who trains to achieve their goals and instil a confidence in them to be the best they can be. Throughout all the levels from Children's classes to adults, Kevin always held safety in high esteem and with that he imparts the same discipline in all his students. I trained with Kevin for approximately two years and he respected my black belt status which I achieved at a previous club. Through Kevin's extensive knowledge and helpful training he helped me achieve a greater understanding and discipline in my Karate which also has a positive impact upon my life outside of karate. I have been training with Bushido Hombu under Kevin Archibald for 11 years, coming from a traditional Shotokan background. Since joining the association my training has improved no end, Kevin has opened my eyes to a whole new mind set to the way I train and the potential I can attain. The training is tailored to the individual student and not a one rule for all which cannot work as everyone has different abilities and limitations. The training and grading systems are very professional and turn out a high standard of students that out class similar grades in other clubs I have trained in over the years. A very safe, family friendly and social club with a pleasant atmosphere to train in. In closing a great club and instructor I a proud and honoured to be a part of. I have known and trained with Mr. Kevin Archibald for around 5 years. He is a pleasure to know and train with. I find his teaching skills to be of a very high and unique standard. Kevin's knowledge is of extremely high quality and he runs classes to suit ability and convenience for e.g family classes, advanced classes as well as in depth seminars. I train in his advanced class every Monday and I find it to be interesting every session, I always learn something new and find his training environment to be none other than safe. Kevin is very knowledgable and most importantly understand each and every one of his students and he makes time for everyone. In my opinion, Kevin is a great instructor and has become a great friend. I have been with the club for 2 years and I have learnt so much. There is a great friendly atmosphere in the classes. The lessons are fun and energetic, content is varied from working on syllabus to improving specific techniques. I think Kevin is an excellent instructor - he is very passionate and full of wisdom about Karate - he always notices when a stance is incorrect and helps his students - he is patient and friendly. The Club is run in a very safe and controlled way, Kevin is very strict about following instructions to the letter and will not ask anyone to perform any action unless he feels it is safe to to do. I am very glad I joined this Club and would highly recommend it to anyone. Kevin provides Karate instruction suited to his pupils, providing a positive learning environment and without restricting the class to dogma. Kevin sets a high standard and applies these fairly. He always offers helpful advice and real opportunities to learn by attending extra classes and seminars for example. Kevin leads by example, raising the level of his students appropriately. I have been a Bushido member for approximately one and a half years and find the club absolutely amazing! Very fresh and functional approach to a traditional Japanese martial art. Highly qualified Instructors who always teach to high standards with amazing enthusiasm. Even with rising amount of members safety is and always was a number one priority. Since joining I have rapidly increased my fitness and learnt much about self defence that is of great use in my job. Our family has been receiving karate training under Kevin for just over a year, in Bushido Hombu's 'family' class. In addition to this Chris (dad) and Emily (daughter) have participated in other classes and seminars ouside of the 'family' class. Bushido Hombu is a very professional outfit and is very well organised and run. The focus is always on quality tuition and training, and we have never felt that Kevin is running the school as a business. We have really enjoyed our participation in the club and plan to continue our training under Kevin. 12 months ago none of us would ever have thought that karate would offer us so much - physical fitness; strength training; increased balance and flexibility; self discipline and meeting some really fantastic people. The classes are also very inclusive and eveyone's training needs are taken into consideration. We would have no hesitation in recommending Kevin, his associated instructors or Bushido Hombu as a whole. Great family friendly club, that teaches you the right way. Not for profit which means its run for the love of Karate and not as a money making scheme.......very refreshing. Kevin strikes the right balance between making training fun, learning the martial arts and discipline. All the right ingredients to make for a fantastic club. I have known Kevin Archibald for nearly 20 years now and I would say he is a balanced, intelligent and well rounded Karate practitioner and Teacher. He has solid roots in a well respected Karate background going back to his Childhood. In 1996 I trained extensively with Kevin in Luton, at the Japan Karate Association United Kingdom. At this time he was a Black Belt Instructor, with his own club teaching Shotokan Karate. Kevin is very knowledgeable in his Karate and very patient and understanding as an Instructor with a ‘more than capable’ set of physical attributes to match. He is of a trustworthy and honourable character and is well respected in his community and amongst his Seniors and Peers. He continues to selflessly pursue his love for Martial Arts, sharing without a second thought the knowledge that he has gained over many, many years. At every opportunity he offers help to others including myself and it is with great pride that I write this reference. As 5th Dan Karate Instructor and International Director of a well respected Karate Organisation I have no hesitation in recommending Kevin Archibald for a high level of accreditation. My son joined the club as he had suffered enormously with bullying at his school, and we wanted him to rebuild his confidence and feel he could move forward to control his own situation. We looked at many different clubs and activities including boxing, judo and karate. Eventually and after much research we settled on bushido hombu. We did this primarily as the instructors Kevin, Karly and Richard run several different classes and seem to focus far more on the needs of the pupils and that pupils own strengths rather an entirely prescriptive teaching of technique with no flexibility to build up a practical application. 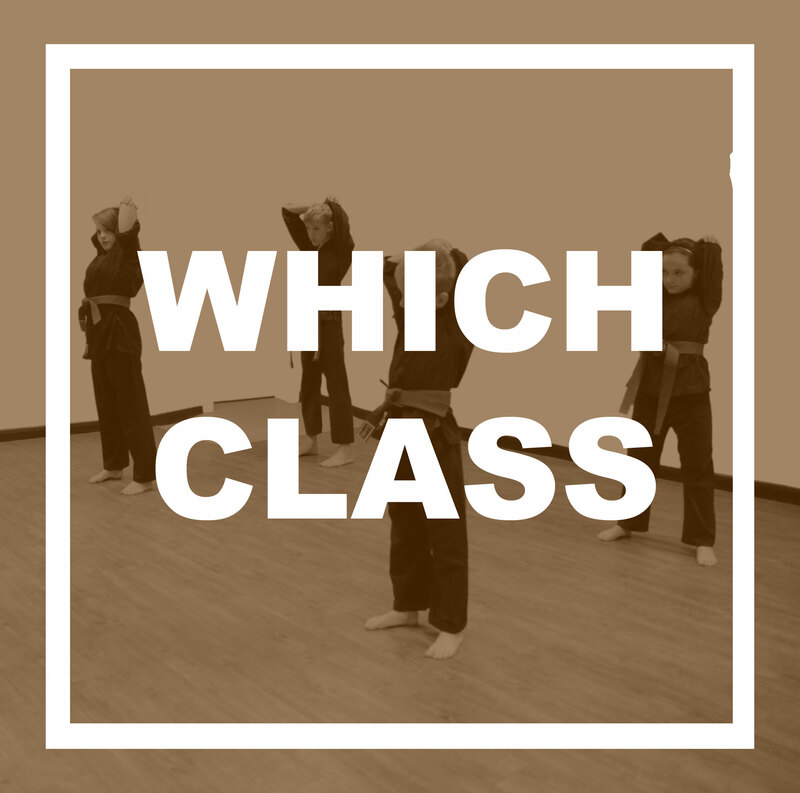 We found each individual class has its own atmosphere/ethos so you should easily find class that suits your own learning preference if you would like to try the club. Extra seminars are run each month covering a variety of topics, this helps keep your motivation going as you'll cover things you've never done before from age related general self defence, bo staff training, through to Krav Maga. After 14 months my son is due to grade to achieve his green belt, but more importantly, he is happier and feeling more positive. Because of this I decided like many of the parents rather than just sitting there and waiting for the class to end I have joined the club, and signed up the two younger brothers (four of us in total....poor kevin). I have been training weekly with Kevin on a one-to-one basis for around two-and-a-half years. The nature of private sessions means that I enjoy an extremely tailored approach to learning karate, and allows a more in-depth exploration of the theory and application of techniques that might otherwise be impossible in a class setting. Access to weekly classes and the excellent monthly seminars also means that I have valuable interaction with other Bushido students. I have always been struck by the dedication to, and passion for, karate that Kevin exhibits, and in turn infuses the Association's members with. Kevin's approach to teaching is both supportive and challenging, and my confidence and self-esteem - as well as my fitness - have improved immeasurably during my training. Kevin Archibald is a rare and exceptional instructor; his martial arts knowledge and competence are phenomenal and he produces students of the highest calibre. Throughout my time training with Kevin, I have been supported far beyond what I would expect of any ordinary club, being given the opportunity to excel through the instructor training program. Having been given, through this program, an insight into the administration and running of the club, I can attest that Kevin scrupulously ensures the safety of every student whether it be by continuously ensuring instructors are up to date on first aid qualifications, or through the creation of the child protection policy. As for the in-class experience, lessons are engaging, fun and, most importantly, different. Kevin does not prescribe to the endless repetition of traditional techniques that many associate with karate but instead finds new and inventive ways to teach the syllabus. The results are students who have a better understanding and physical ability than those trained elsewhere, but who have thoroughly enjoyed the process of getting there. This is the direction karate needs to go in - something the rest of the karate community is starting to realise - though Kevin has already been saying for nearly 20 years. Teaching takes place in a relaxed but controlled environment where all students can train safely and develop their confidence, technique and fitness. 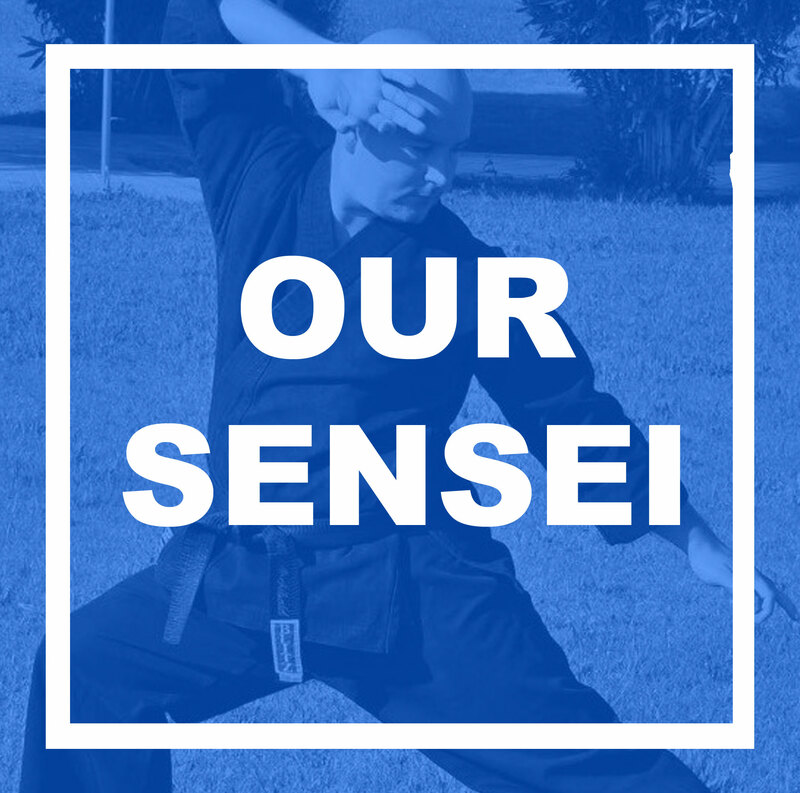 Sensei Kevin puts the development and needs of every member of the club first, he is always supporting members in every aspect of their training and goes out of his way to encourage additional learning and development for all of his students. There are always additional learning opportunities for every level of member including discussion sessions, training courses and monthly seminars. Kevin utilises a dynamic teaching style which looks to modify and adapt techniques for individuals to ensure they work regardless of ability, age or fitness levels whilst ensuring they stay within the framework of Karate. He always explains techniques thoroughly and encourages discussion. Having trained at Bushido Hombu for over 7 years, I can wholeheartedly endorse, the Bushido Hombu Association, Bushido Hombu club and Sensei Kevin, I believe there is no better training environment for anyone who wants to begin to learn karate, continue their current training or return after a period of time away from training. Most instructors respond to this by reciting the history of karate as they were told by their own instructor or regurgitate the contents of a book or manual instead of actually answer the question. (as an aside, this history is usually unfinished or incorrect). Is Karate just kicking and punching? No!! Karate was a mixture of the fighting arts in developed in Okinawa and other countries that traded with the Islands… making it a Mixed Martial Art (MMA) hundreds of years before the modern UFC style tournaments were ever thought of!! True karate does not impose any limitations on techniques, if a movement can be used in combat then it is Karate. Punches, kicks, elbows, knees, arm locks, grappling, ground fighting and even head-butts are all valid karate techniques. Karate is not what you do, but how you do it! Often, karate training techniques are labelled as not being effective for use in a real life situation, it should be remembered that karate training is not a constant barrage of real life situations! A large portion of training up to black belt is purely educational, with reference to the body, and how it works, increased control and body conditioning. It is the process of going through the years of this training which enable you to perform techniques required in a real life situation. At the end of the day, karate is whatever you want it to be…. + If you want to get fit, karate will help, but you will only get out what you’re prepared to put in. + If you want to learn self defence, karate will always prove beneficial, but an instructor who specialises in self-defence and street bunkai should be found. + If you want to learn how to smash through wood, then yes; some Karate training will involve this (though not generally within the Bushido Martial Arts Association!). + If you want to gain confidence, the right Karate instructor can help you. + If you want to win competitions, then yes; a more sport-oriented club will help you to achieve this. How you use the knowledge and ability gained from training depends on you as an individual, the karate itself is really the study of these two elements. At Bushido Hombu we do not limit ourselves or demand our clubs stick to one style; the Hombu (Head Club) trains in what we call Generic Karate. All techniques are allowed and all body parts can be used. If you are however looking for a particular style of karate, there are other clubs within the association that specialise in many of these styles by preference of those instructors. The karate taught by an instructor needs to be they karate that they want it to be. We hold an assessment session every four months (February, June, October) where all members under purple belt (4th Kyu) perform their current syllabus in front of the grading assessment panel. During the assessment session a normal class is run with each grade group being called individually for assessment while the class continues in the main sports hall. Everyone takes part in the assessment regardless of readiness, eligibility or desire to gain the next grade as the intention is not only to ensure that people gain belt promotions in a timely manner, but also so that regular feedback can be given for continuous improvement. 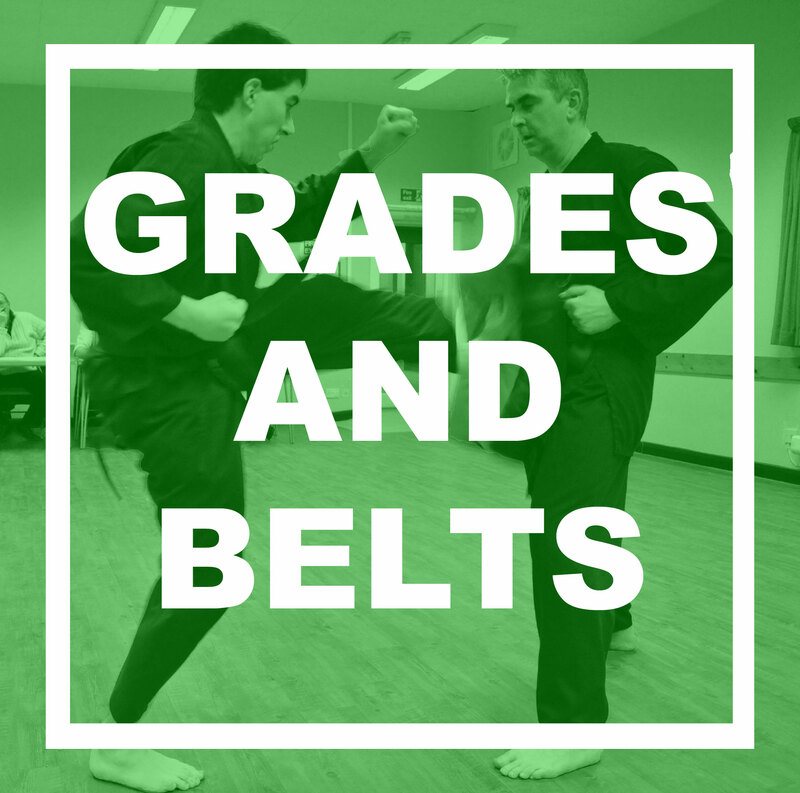 For those ready to attempt a brown or black belt grade (3rd Kyu through to 6th Dan) there are two opportunities each year in October and April. These official gradings will be held outside of normal classes at additional cost and spectators are welcome. 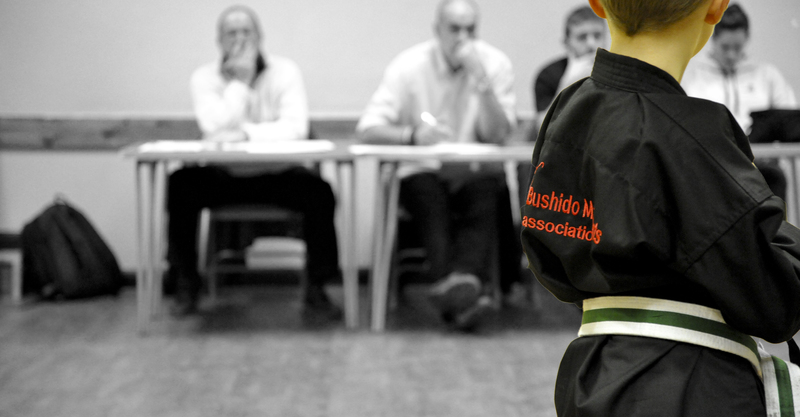 To apply for a grading you must submit your request to your Sensei 3 months before the desired examination date. Chief Instructor – Kevin began training in Karate aged five. Having suffered with severe asthma from birth with regular time off school and having low confidence, Kevin’s parents took the advice of a good friend and took him along to the local class. As he trained his health, confidence and physique all improved, which his family put down to the body conditioning from the Karate training. By the age of 13, the symptoms of Kevin’s asthma had all but disappeared and he was ready to take his first dan black belt. This was taken along-side adults in front of the examination panel of Bukonkai Karate International, Kevin passed on his first attempt. As Kevin’s experience grew, he attended many courses and tournaments and began supporting his instructor in the running of the club and teaching the juniors. When Kevin’s instructor sadly ceased his karate training to pursue other interests, Kevin (aged 18) took over the remaining students and began his teaching career. Soon afterwards, Bushido joined the JKA (UK) where Kevin retook his Shodan grading to achieve JKA recognition. Since leaving the JKA in 2000 (just before the big split within Japanese Shotokan), Kevin has had mixed training under several Multi Martial Art Associations. This has enabled him to begin mixing training styles and assess what techniques, stances and styles best fit his students on an individual basis. It was in this period that the Bushido Fitness and Self-defence system came into being. 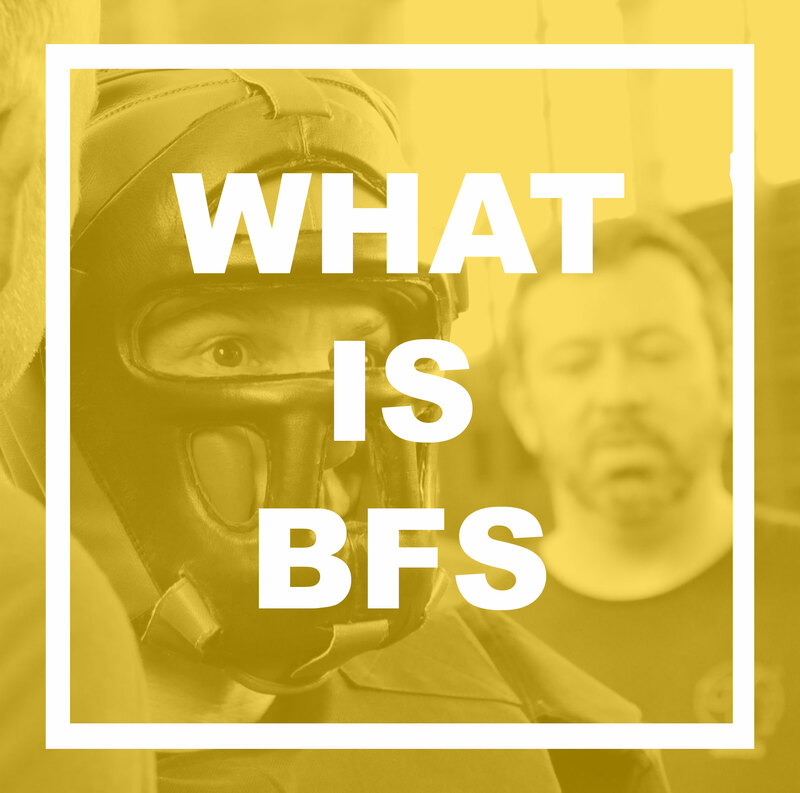 BFS is and always will be a work-in-progress as it is ever developing with every new student that comes along. As of December 2013 Kevin has also been made an Honoury Member of ICCS Krav Maga, others with this honour include the founder of Israeli Krav (Moshe Katz) and the Founder of the First Response Counter Terrorism Teams. Kevin was also certified as a Level 1 ICCS Assistant Instructor in April 2014, which enables him to officially teach Krav Maga in the UK. Kevin is working closely with Pilates/Yoga instructors, Krav Maga instructors and other Karate Sensei to get the most from martial arts; always looking to perfect the art of Karate and develop interesting, fun and effective training for BFS. He is passionate about martial arts and fitness and is intent upon increasing public safety through his teaching. Kevin is a fully insured and DBS (the new CRB) checked CoachMark registered instructor who teaches because he believes it is his duty to pass on what he has learned. The club is here to help people and not to make money, we are a group of friends from the youngest 5 year old white belts to the oldest 66 year olds and black belts. 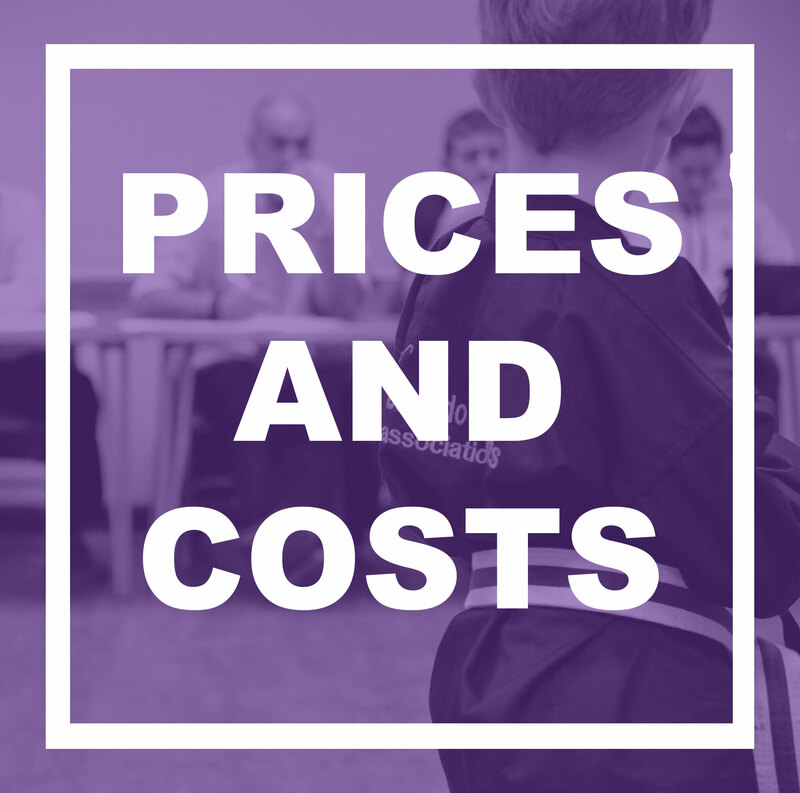 We aim to keep our charging structure as simple as possible while ensuring that cost is not a barrier to those who wish to spend more time training to help improve themselves and our dojo. To achieve this we offer all training at our Hombu Dojos in one monthly payment. The below shows our monthly payment schedule, including family packages*. License/insurance fees are included within the monthly mat fees. – Prices are based on payments being made EVERY month regardless of attendance, if injury/illness or work commitment will prevent attendance for a period greater than 8 weeks you may apply to suspend payments for the period. Payment must be received at least 7 days before the grading date. Should a Brown/Black Belt grading attempt be unsuccessful, 50% of the grading fee will be refunded. Click here to see the location of our venues. + Turn up at one of our sessions We would recommend visiting us about 10 minutes before a session starts so that one of our instructors can spend some time answering your questions, while giving you time to change and join in, should you so wish. Initial taster sessions are priced at £7 per person per session, with a limit of 2 taster sessions before committing to join. Should you wish to join there are several packs available from the bear minimum (a Gi – suit, syllabus book and grading record book) up to a more comprehensive packs that include protective equipment and all you need up to around Brown Belt. From the day you hand in your membership form and fee you will not be charged anything further until the first Direct Debit is taken on the 1st of the following month. The joining packs are heavily discounted and can be viewed and selected on your membership form that will be provided by the Dojo Manager. In addition to this you will also receive a welcome letter that will detail all of the information you need, including payment details. 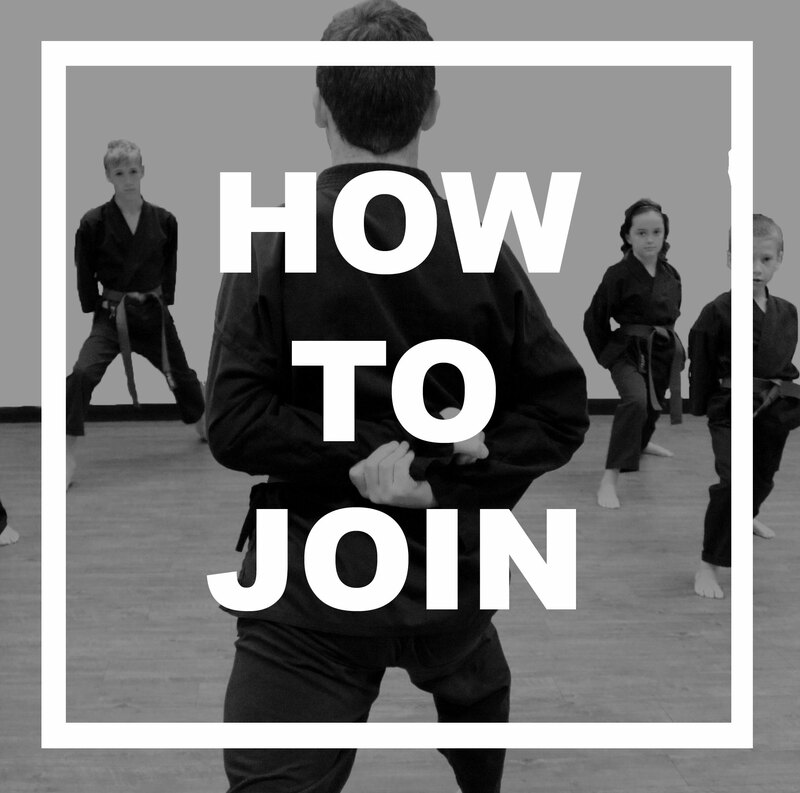 From that moment you are a member, there are no annual fees or forms to complete and you simply stay a member of our karate family for as long as you wish (so long as monthly mat fees are paid on the first working day of each month). We hope to see you soon, so that we can support you on what is a very rewarding journey of self discovery and improvement.